Photos by Ginny Kropf: Rosemary Eden, Margaret Kelly and Lee Smith, all members of the Senior Center of Western Orleans, help arrange wreaths which have been donated for the Senior Center’s Hall of Wreaths. Smith holds a Disney-themed wreath made by Sherry Tuohey, who heads the wreath project. Wreaths will be accepted and displayed through Nov. 24. 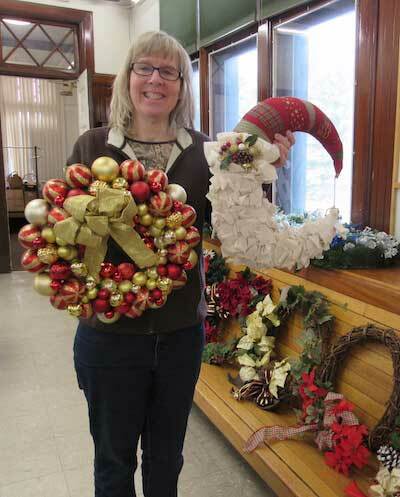 Sherry Tuohey, who has started an annual Hall of Wreaths at the Senior Center in Medina, shows off several of the creative ones she made for this year’s event. MEDINA – Christmas is already in the air at the Senior Center of Western Orleans, where rows of holiday wreaths are on display for the annual Hall of Wreaths. The Hall of Wreaths is an idea started last year by Sherry Tuohey, when the Center was trying to come up with a way to participate in Medina’s Olde Tyme Christmas. The annual Christmas celebration takes place in downtown Medina the Saturday after Thanksgiving and features a parade and arrival of Santa Claus at noon and special events and sales throughout the stores, capped off by fireworks and the spectacular Parade of Lights at 6 p.m. The Senior Center, which is barely a stone’s throw from Main Street, wanted to get involved. Tuohey suggested the Hall of Wreaths and it was an immediate success. Dozens of wreaths were donated and sold to the highest bidder on the day of Medina’s Olde Tyme Christmas. 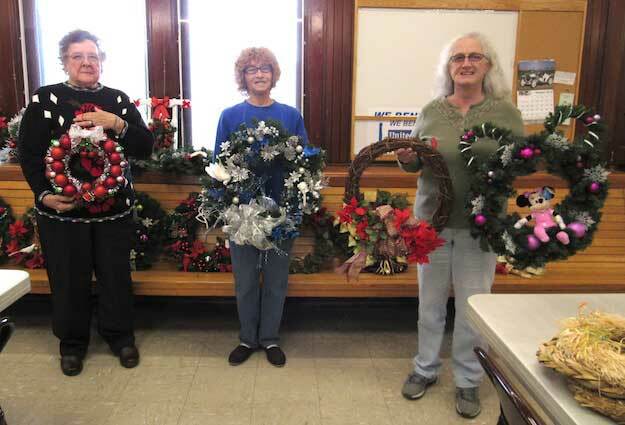 This year, Tuohey scheduled two wreath-making classes at the Senior Center, which resulted in several dozen unique creations, including bulb wreaths, a half-moon Santa and a Micky Mouse wreath. Anyone may donate a wreath or make a bid to buy one. The Center is open from 9 a.m. to noon on Mondays and Tuesdays, and from 9 a.m. to 4 p.m. Wednesdays and Thursdays.